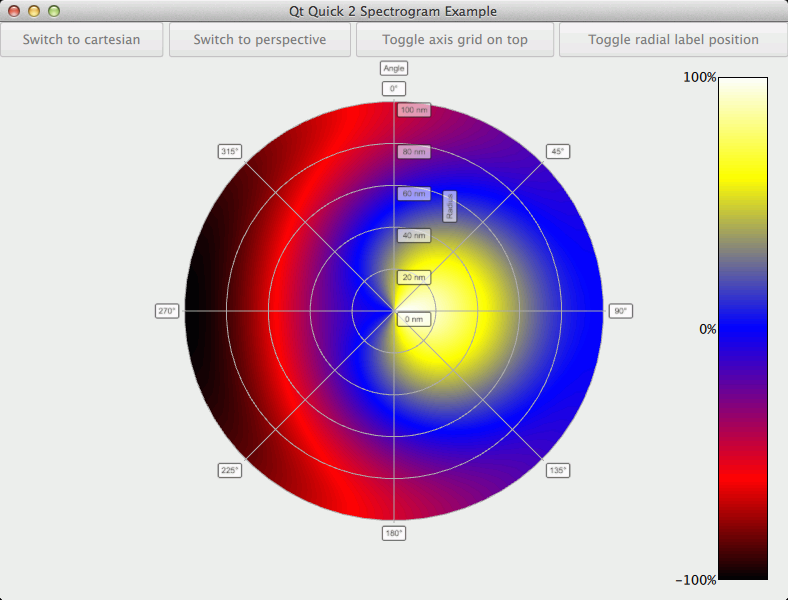 The Qt Quick 2 Spectrogram example demonstrates how to show a polar and cartesian spectrograms and how to utilize orthographic projection to show them in 2D. Spectrogram is simply a surface graph with a range gradient used to emphasize the different values. Typically spectrograms are shown with two dimensional surfaces, which we simulate with a top down orthographic view of the graph. To enforce the 2D effect, we disable the graph rotation via mouse or touch when in the orthographic mode. The focus in this example is on showing how to display spectrograms, so the basic functionality is not explained. For more detailed QML example documentation, see Qt Quick 2 Scatter Example. text = "Switch to cartesian"
text = "Switch to polar"
In the polar mode, the X-axis is converted into the angular polar axis, and the Z-axis is converted into the radial polar axis. The surface points are recalculated according to new axes. When the projection mode changes, we adjust the value of the rotationEnabled property of the customInputHandler to control the rotation.